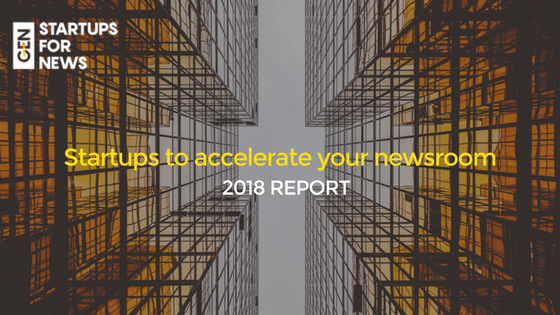 The Global Editors Network has just published their Startups for News report which showcases 30 new startups launching new applications and tools for news and newsrooms. Some are still at beta stage but many are available now. The winner of the 2017 Startups for News competition was Flourish, which is one of the startups listed in the report. Flourish was founded in 2016 by Duncan Clark and it allows anyone with a spreadsheet to produce world-class visualisations and interactive stories. The platform makes it easy for non-coders to produce and publish high quality interactive stories based on flexible templates. Another startup listed in the report is BigVU which is a TV studio in your pocket. The application turns your phone into a teleprompter for shooting video pieces to camera. “If you keep procrastinating and putting off planning for it, the future shows up and you won’t have had any part in creating the reality you now have to deal with.” These are the words of Amy Webbs who commissioned the Global Survey on Journalism’s Futures which shows that newsroom staff between ages of 44 and 64 tend to be ‘nowists’: they think about the immediate future and the near-future rather than the long-term. This is a cause for concern as this group of people often hold leadership positions. They make the strategic and operational decisions that affect their own newsrooms and the sustainability of news ecosystems as a whole. But experimenting with up-and-coming technology is difficult for many newsrooms that lack technical staff. The International Center for Journalists global survey on the adoption of new technologies in news, shows that only 5% of newsroom employees have degrees in technology fields and only 2% of the news organisations surveyed employ technologists. Building your own tech is time consuming, resource-intensive, and the payoff may not be immediately apparent. It is it worth the effort? This is why collaboration between startups and newsrooms is critical. Startups for News, Global Editor’s Network’s annual startups competition run in partnership with journalism.co.uk aims to help the industry navigate this collaboration. It identifies young startups that will help news organisations produce, distribute and monetise quality journalism. The Startups for News report showcases 30 startsups that are bringing innovation into newsrooms. They are divided into eight different categories: visual and interactive journalism; mobile journalism; information gathering; artificial intelligence services; analytics; monetisation; delivery; and personalisation. You will find a mix of tools providing quick fixes to recurrent newsroom challenges and solutions that could have a transformative effect on the way newsrooms work in the long term. The 30 top media startups have the potential to help newsrooms tackle what has become a central concern: the erosion of trust and the spread of misinformation.